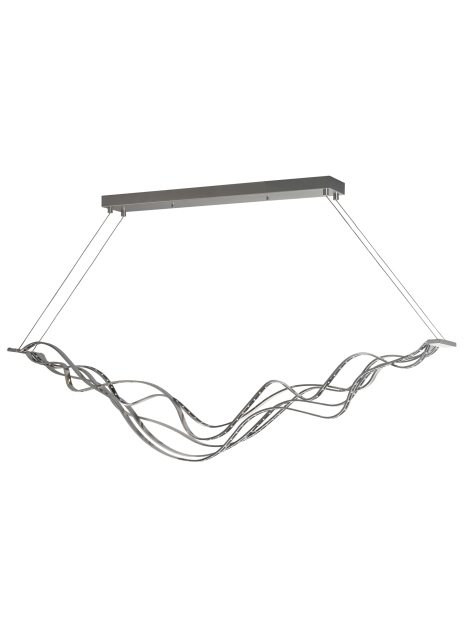 The Surge linear suspension by Tech Lighting appears to float effortlessly with its smooth wavy lines. The graceful force of ocean waves is captured when gently undulating bands of downward and upward firing LED strips join to form a striking fixture capable of creating layers of illumination. Fixtures can be linked together end-to-end to create longer, continuous runs using the optional Mechanical Connector. The Surge fixture spans 54” in length making it ideal for conference room lighting, foyer lighting and a host of commercial and residential lighting applications. Your choice of fully dimmable LED lamping ships with the Surge saving you both time and money. Downward and upward facing LED strips provides downlight and uplight to create layers of illumination. To empower lighting designers to create unique applications, fixtures can be linked together end-to-end to create longer, continuous runs using optional Mechanical Connector. Includes 75 watts of LED (63 watts, 4200 net lumens of downlight and 12 watts, 800 net lumens of uplight), 3000K. Ships with 12 ft of field-cuttable cable. Dimmable with low-voltage electronic dimmer.